This is the 1/35 Scale German Panther Medium Tank Plastic Model Kit from Tamiya. For ages 10 and over. Retail $23.50 SAVE 20% ! "Got me Back Into Modeling"
I took up modeling at the age of 10, and stopped a couple years after. Now I am back in and re-learning the ropes as a more mature builder, and it is because of this kit. Simple, yet rewarding to build, it got me back into modeling! Aside from some extremely slight defects which I&apos;m sure can be fixed with putty, this is an excellent kit. Includes two realistic figures - a driver and commander. Formidable gun barrel and escape hatch. Kit is great ! Tamiya never disappoints with quality . The price of Tamiya models is always lower and I do think this reflects on part count and assembly difficulty . I had been away from building models for years ,needed something to do while the boy is over so we build models . I love Hobbylinc and the prices , always something to shop for . I have moved on to more challenging models with much higher parts count but look at Tamiya for something the boy can do . I do wish Tamiya had some more choices for tracks like their Char B1 bis which are awesome ! This Panther kit was the best fitting , easy to assemble with instructions of highest order . One cannot argue with Tamiya quality . This kit is great for beginners , good for experimenting on finish painting . This was a fun build. My first Tamiya model and it went together pretty smoothly. The only hiccups I had was the instructions were different for me and seemed a bit hard to follow in a few small instances, and the mounting of the rubber track. One of mine was too short by about 1/2 an inch. It would not wrap around the wheels without that gap. So I had to steal another track from a different kit to finish. "When you do new with an old kit"
The kit may be old and have many flaw, but if you are a beginner or just want to relax and building something easy it will do the job. Those who say the kit is full of inaccuracy, you may be right but it is not different for newer Panther Kit regardless the company. All have some degree of inaccuracy because in the 4 years the Panther was built by the German, every month that pass there where change on the vehicle as it exit the production line. It&apos;s not like there was only 3 models ever made (Panther D, A and G) without any modification during there production. 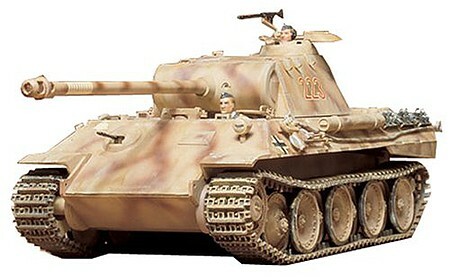 For example if different company (Tamiya, Dragon or Trumpeter) was to put on the market a kit of a Panther Ausf A, depending of the company they will have some difference in the component for the same types of Panther. When the kit was originally release it was as a RC Tank, and many evidence can be found as you are building it. The lower hull still show the holes in the bottom, there is a battery holder inside the hull, the teeth on the return wheel are just few examples of it&apos;s origin. Regardless it will not be a problem for building it and you can easily fix that. But if you are a beginner it should not bother you if it is not fix. Despite being an old kit and for some who say you get what you pay for, overall it is not that bad. The kit come with rubber track, fairly good details components on the vehicle, like you can see the welding seams everywhere and many surfaces of the vehicle show good details. The kit include 2 crew members (Commander and driver). Waterslide Decals It is probably one the best set of decals I ever found in a kit. You may be restricted with the choice of the numbers you will put on your vehicle but I find it really minor. Numbers are 223 - 309 and 421 but the great think is you have 3 set or should I say 4 set of each number. The german forces put the number on there tank on the left and right side of the turret and also at the rear of the turret on the storage box and if there is no storage box sometimes they paint of a smaller size the number at the back of the turret. Also they have 4 standard german cross, 3 will be use with this vehicle (one on each side and on the back). 1 Victory marking to be place on the barrel. And you have the option of 10 different Divisional Signs to be place on the front right of the vehicle (Totenkopf (1942-1945), Hohenstaufen (1944), Leibstandarte Adolf Hitler (1943-1945), 3 panzer division (1940-1945), 18 Panzer Division (1940-1945), 13 Panzer Division (1940-1945), 4 Panzer Division (1940 campaign of France), Das Reich (1942), Grossdeutschland (1940-1945) and 6 Panzer Division (1941-1945). Painting Unfortunately for the beginner there is no help. The kit offer only a basic color information/explanation use by the German throughout the war. There is no color reference for the different component (tools, exhaust, road wheel, etc). With some research over the internet you should be able to find easily all information needed. Conclusion For a beginner it is a great kit to consider. It&apos;s inexpensive, easy to put together (172 parts), so nothing to fancy. For those, more advance modeler you may consider this kit if you are more interested of spending your time in painting/weathering instead of building. It will give you a good opportunity to experience some paint scheme and weathering details at a fraction of the cost of a more details kit. NOTE: Please keep all small parts and sharp edges away from children ages 3 and under.